According to The American College of Sports Medicine, a percentage of body weight along with the age will be used together to determine the proper ranking of the bench press or 1RM (1 Repetition Maximum). To answer your question about ‘’how much should I bench press?’’ keep reading on. Note: The 50th percentile is also known as average, the 70th percentile is considered to be above average, and the 90th percentile is well above average. Men who are in the age range of 20-29 years should lift 106% of their totally body weight for 50th percentile, 122% for 70th percentile, and for 90th percentile they must lift 148%. For men who are between 30-39 years of age, 93% for 50th percentile, 104% for 70th percentile, and 124% for 90th percentile. Men who are between 40-49 years of age should lift 88% for 50th percentile, 93% for 70th percentile and 110% for 90th percentile. Men between 50-59 years of age should lift 75% for 50th, 84% for 70th and 97% for 90th percentile. Given below are some examples for men's average bench press based on the age and the body weight. You can calculate yours according to what has been discussed above. Women from 20 to 29 years of age should lift 65% of their body weight for 50th percentile, 74% for 70th percentile and 90% for 90th percentile. Women from 30 to 39 years of age should lift 57% of their body weight for 50th percentile, 63% for 70th percentile, and 76% for 90th percentile. Women from 40 to 49 years of age should lift 52% of their body weight for 50th percentile, 57% for 70th percentile and 71% for 90th percentile. Women from 50 to 59 years of age should lift 46% for 50th percentile, 52% for 70th percentile, and 61% for 90th percentile. Women who often wonder ‘’how much should I bench press?’’ can refer to the following table to know the average bench press one can do, based on the age and the body weight. Bring more bench pressing in your life. Bench press at least twice a week while give yourself a rest of 3-4 days in between. Stop looking for diversity and focus on specificity. To master the skills of bench pressing, you need to do it more often. However, dips, dumbbells and pushups don’t train the movements but only strengthen the muscles. Work on the most effective bench press form. Having an improved bench press form increases its effectiveness. Weight lifting becomes easy when the bar moves the shortest distance from the chest. This in turn enhances the stability and prevents from injuries. An improper form may cause impingement of the shoulder, wrist, elbow and lower back. Minimize the reps. 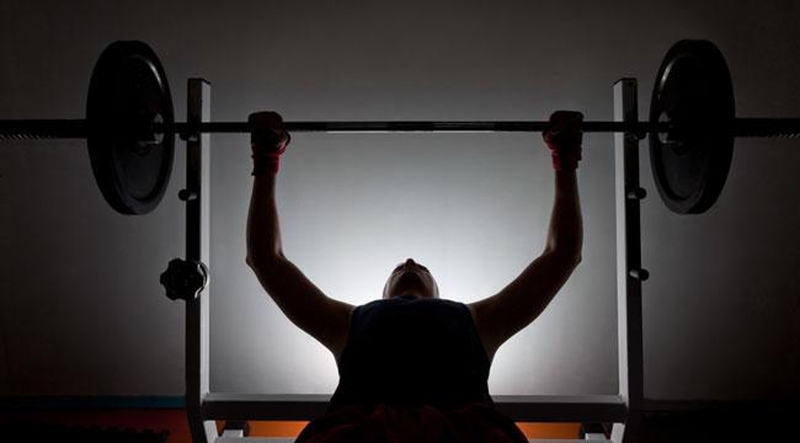 Switching the bench press from 8-10 to 5 helps build endurance and it’s less exhausting. With fewer reps you can add in more weights, so the muscles become stronger and bigger. Embrace microloading. Microloading refers to addition of <5lb/2.5kg in each workout. It directly elevates the bench pressing by slowing the plateaus. Plateaus can be delayed by smaller increments, because it slows down your progression. Adding weight becomes easy when you bench press heavy. Resting between the reps. It’s essential to rest for 5 minutes between each set of heavy bench press. Resting for longer duration increases the ATP (adenosine triphosphate), a kind of energy source required for the next rep, which will make the rep harder. Warm-up for bench press. Bench press warm-ups include initial lighter sets. Gradually start adding the weight until you have reached the work weight. It’s recommended to warm-up with an empty bar before bench pressing. One breath, multiple reps. Holding your breath while doing multiple reps will exercise your chest, shoulders and back better. However, this doesn’t apply to the beginners. If you feel like you’d pass out, then probably you are overdoing it. Keep away from the shiny objects. These include boards, bands and chains used during bench pressing. Bands and chains build the weight at the top whereas the board lowers the motion range. These objects are not much effective. Add paused bench press. It serves well as an assistance exercise and enhances the bench press. It helps in strengthening the bottom of the bench press, as it minimizes the time under tension. Patience is the key. For bench press, you need patience as it focuses on strengthening the smaller muscles which takes more time. With small increments and proper form, bench press gives fruitful results over time.